Snuggle down into these lusciously thick, silky Elle Two Tone Supersoft Socks when you want to spoil yourself and have a cosy moment. With their tufted ‘teddy bear’ plush knit, they are designed for an absolutely blissful feel. 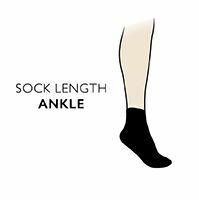 The tops of these ankle length socks have gentle elastication, with the Elle logo embroidered on them in a contrast shade to the two tone yarn. The knit itself stretches for a comfortable fit.